After a time: unlike verse 4:2, the author introduces the verse with a Hebrew formula indicating an indeterminate passage of time. Literally, the Hebrew reads, “And it was from end of days” (וַיְהִי מִקֵּץ יָמִ֑ים). fruit of the soil … first-born females from his flock: I’ve translated this verse in a way as to make clear that not only was the act of offering important to God, but also the personal value of the offering was even more important. In other words, the greater the sacrifice on the giver’s part, the more highly regarded is the act itself. 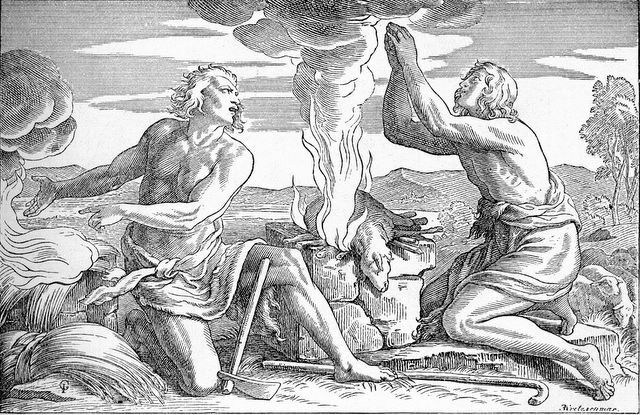 In this verse, the author makes clear that Cain’s offering is perfunctory whereas Abel’s offering constitutes a substantial sacrifice. Not only the fat of the first born but the fat of the first born females – see commentary below. The key word in this phrase is “their” (underlined for emphasis). In English, ‘their’ is a third-person plural possessive pronoun1)As in “their apples” or “their children”.. However, unlike English (but like so many other languages such as Spanish, French, and Italian), Hebrew is inflected for gender. For example, in Italian the indefinite possessive pronoun ‘their’ occurs in two forms: i loro (when the antecedent refers to a masculine noun) and le loro (when the antecedent refers to a feminine noun). In this case, the pronoun (‘their’) in question refers to a female antecedent. It seems that the author has taken pains to inform us that the fat in question has been taken from the females of the flock. Now, for domesticated herds (sheep, cattle, etc.,), females are more highly valued than males. The shepherd needs only 1 ram to increase the size of his flock, but to accomplish this same end he needs as many ewes as he can get. The loss (or sacrifice) of a ewe would have been deeply felt and the author goes out of his way to inform us that Abel’s sacrifice would have been economically painful. The take away message from this verse, I think, is that the author is drawing a stark and obvious distinction in the worth of the two sacrifices. Abel’s reflects a greater respect for the LORD by his willingness to make a substantial and painful sacrifice. As for Cain? Not so much. favored: derived from “וַיִּשַׁע יְהוָה אֶל־הֶבֶל וְאֶל־מִנְחָתוֹ” which, literally translated is “and-He-gazed the-LORD to-Hevel and to-his-offering”. To ‘gaze’ in this context means ‘regarded’ or less ambiguously, “favored” Hevel’s offering. The author is telling us that God approved of Abel’s offering but largely ignored Cain’s (See the commentary for Genesis 4:5-6). And it was from the end of days that Qayin was caused to bring from the fruit of the soil an offering to the LORD. And Abel was caused to bring also [an offering] from the first-born [females] and of their fat his flock. And the LORD gazed toward Havel and toward his offering. 1. ↑ As in “their apples” or “their children”.